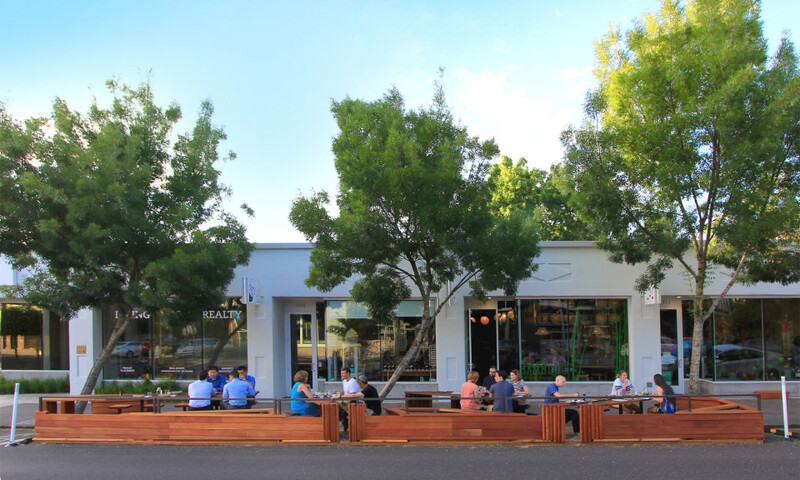 The award winning Bamboo Sushi Parklet (Street Seat) aims to create a more pedestrian friendly and inviting streetscape, offering beautiful planters, seats and activity, rather than concrete and empty cars. Collaborating with a local, sustainably focused sushi business, and a local fabricator we developed the design of this street seat to expand the sidewalk and introduce a safe and welcoming pedestrian environment. The installation adds 27 outdoor seats with table service for the restaurant. Our design balances the simple elegance of Japanese craft with the use of locally sourced and durable northwest materials. 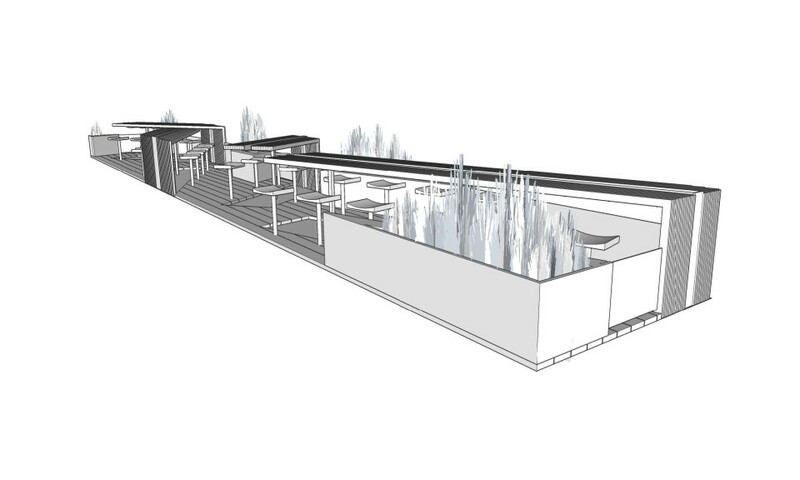 Natural wood, hardened steel, soft plants, and rounded river rock form the palate for the project. 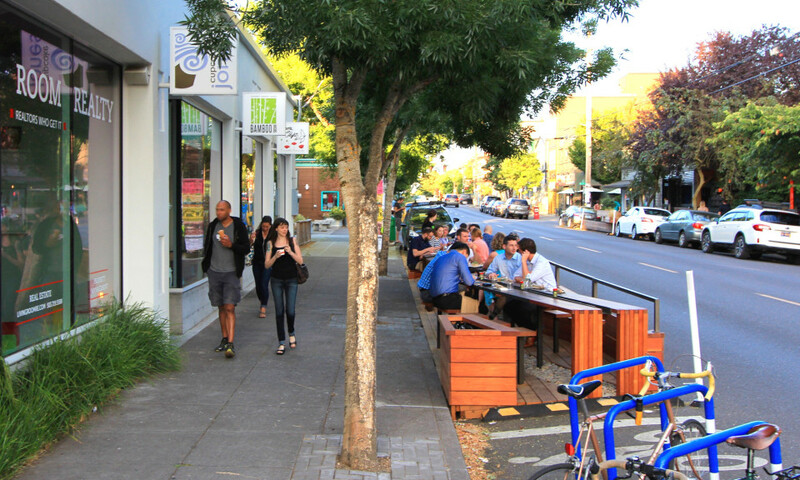 This 45′ extra long street seat extends west from Bamboo Sushi on NE Alberta Street to reach the bike corral at the corner. The base is made from a simple cedar deck, weather sealed for durability. The tables rise up from the deck and cantilever out at various lengths and angles. 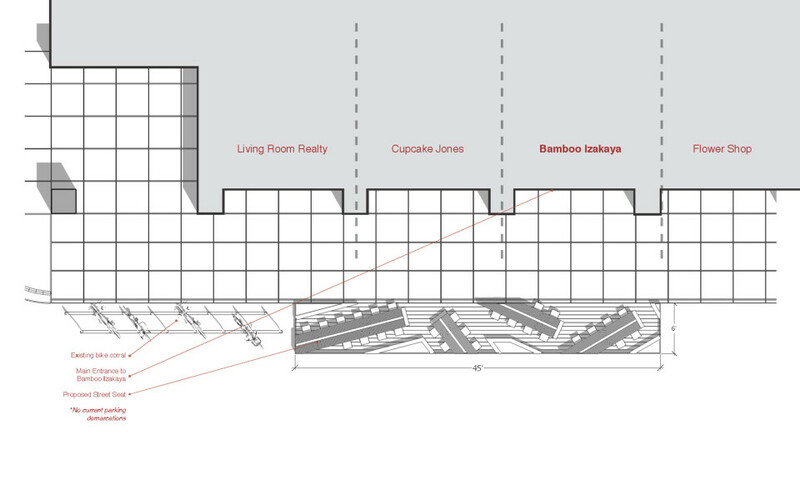 The concept is to create a dynamic space that is unique, catches people’s attention, and draws them into the space. The leftover zones of the bench become planters that are shaped according to the angles of the tables. These 18” high planters also act as benches. They will be filled with plants of Japanese origin that will be selected with recommendations from the Portland Japanese Garden. Under the tables are basins of river rocks that allow water that collects in the table channels to filter down onto the street.